Humans trekking around Mars just became more realistic. It's not reality quite yet, but a new virtual reality experience released by Google in partnership with NASA, called Access Mars, is a step in that direction. The web-based virtual reality (VR) experience lets you explore selected locations visited by NASA's Curiosity rover along its five-year, nearly 11-mile path of discovery. It not only lets you move about the landscape--poking your nose into highly detailed images of whatever catches your interest--but the 3D terrain model shows relationships between geographical and geological features as no 2D snapshot can. 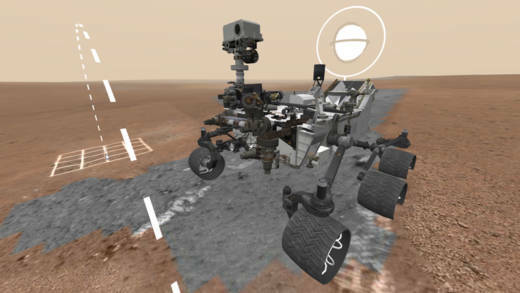 To recreate the 3D terrain of the chosen sites, data from Curiosity's stereoscopic camera system was used to derive a topographical model of the landscape, over which the real imagery is mapped. Curiosity becomes your guide on Mars, letting you see our neighboring world almost as if you are there. Walking on an Ancient Lake Bed? 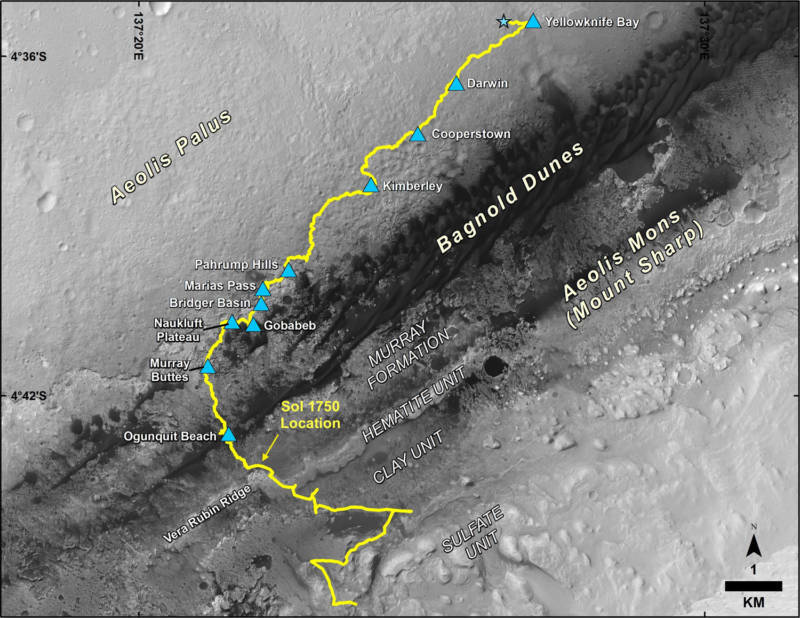 Curiosity landed in Mars' Gale Crater in August 2012, during a mission to determine if, and to what extent, liquid water may have been present in Mars' past. The detection of possible water-associated minerals, like hematite, by NASA's Mars Reconnaissance Orbiter suggested that the 90-mile wide impact crater may have been a lake. Not long after its arrival, Curiosity found evidence of past stream bed activity in layers of sedimentary rock made from sand and gravel not far from its landing site, Yellowknife Bay. As the rover made its way along the crater floor and up the lower slopes of Mount Sharp--a 3.5-mile tall mound of layered sediments at the crater's center--evidence of past water action mounted. The Kimberley Formation strata of water-deposited rock slopes downward toward the crater's center, telling a story of water flowing into Gale Crater before the layers of Mount Sharp had built up. Fine sediment layers in the Murray Buttes were left behind after a stream delta emptied into standing waters along a shoreline, then dropped the sediment onto the lake floor. As you explore Access Mars, keep in mind that it's not just an alien desert you're setting your virtual footsteps upon, but a water-sculpted milieu that may have once resembled familiar Earthly aquatic scenes. Curiosity is currently exploring a rock formation called Vera Rubin Ridge, after reaching the ridge's foot in September and beginning an ascent of its slopes. The location is one that scientists wanted a closer look at even before Curiosity's landing five years ago. Orbital detection of hematite, an iron oxide mineral that may have been formed in water, made Vera Rubin Ridge a priority destination in Curiosity's itinerary. From a distance, down slope, pictures of the ridge revealed repeating horizontal layers in the rock, cross-cut by veins of white material suspected to be calcium sulfate. Whether the horizontal layers of sediment were laid down by water or wind action may be determined when Curiosity gets a closer look, but the veins of calcium sulfate would have been deposited by mineral-laden water flowing through cracks in the rock. What Will You Find on Mars? Sometimes what we find in our explorations depends on what we are looking for. When you prospect in a desert, you expect to find sand, rocks, dust, and grit—and maybe even hope to find gold. But when you hike along a dry lake bed, you may see past mere sand and rock to the watery environment that formed them. With lakes and streams in mind, take a walk with Access Mars, and see what you find.